Hey, chocolate obsessives (you know who you are). Looking for your next cacao-laden fix? Well, welcome to the deep, dark flavor of these cookies. Their richness will remind you of everything you l-o-v-e about chocolate. Say hello to your new besties. The “dark” in the recipe title refers to the depth of flavor these cookies have, not the amount of cacao in the chocolate used. This recipe calls for standard grocery-store semisweet chocolate, which has less cacao that some of the (almost bitter) dark chocolates out there. But feel free to experiment with a darker chocolate if you wish. Mrs. 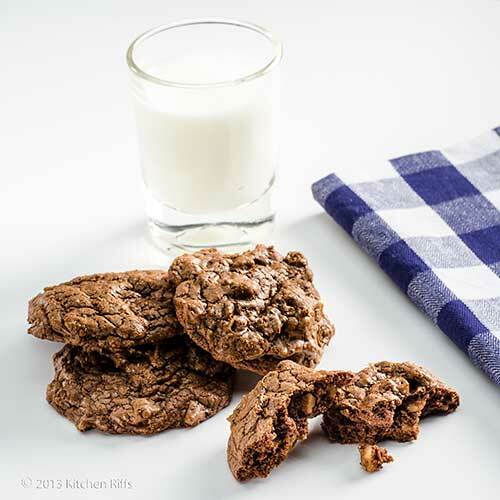 Kitchen Riffs is the baker in our household, and she adapted this recipe from Helen Fletcher’s The Essential Death by Chocolate Cookies. If you don’t know Helen’s blog, The Ardent Cook, you really should check it out—she’s an excellent cook and a world-class baker (and has published books to prove it). Preparation time for these cookies is about 15 minutes, baking time about 13 minutes (depending on your oven). You may need to bake multiple rounds of cookies if you can’t fit them all on your cookie sheets at once, so adjust the total time accordingly. This recipe yields about 24 to 30 large cookies. Leftovers (if you can restrain yourself from devouring the entire batch) will keep in an airtight container at room temperature for up to a week. Preheat oven to 350 degrees F. Line baking sheets with parchment paper (see Notes). In a small bowl, whisk together the dry ingredients (flour, baking powder, salt, and espresso powder). Set aside. Melt about 5 ounces of semisweet chocolate pieces with the butter (about 1 to 2 minutes in the microwave; see Notes for more on melting chocolate). Set aside to cool. In the bowl of a stand mixer (or in a large mixing bowl, using a hand mixer), beat together the brown sugar and eggs. Add the vanilla extract and mix until well combined. Add the melted chocolate mixture to the brown sugar and eggs, and mix to combine. Add the dry ingredients and mix until well blended. Then add the chopped walnuts and the remaining semisweet chocolate pieces. Mix to combine. Drop cookie dough by heaping tablespoons onto baking sheets, leaving at least an inch between the cookies. Place in the middle of the oven and bake for about 13 minutes, or until the tops of the cookies feel set. Remove from the oven and let cookies rest for 5 to 10 minutes on the baking sheet. Then, using a large spatula, move them to a cooling rack. Almost every baking powder you’ll find on your grocery shelf is “double-acting.” It’s called double-acting because you get a first reaction (the bubbles that help cause cookie dough to rise) when you mix the powder with wet ingredients, then a second reaction when the cookies hit the heat of the oven. We like the Medaglia d’Oro brand of instant espresso, but any good brand should work. 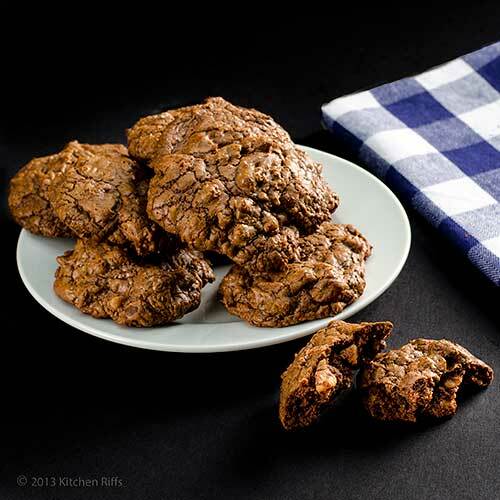 The original recipe for these cookies called for using about ½ teaspoon cayenne pepper instead of espresso powder. This version is quite flavorful, and you might want to try it, especially if you like a little “ping” in chocolate. You could also probably use cayenne along with the espresso, but we haven’t tried that variation yet. We generally use about 4 ounces of semisweet baking chocolate squares (chopped into chunks), plus another 6 ounces of semisweet chocolate chips (Ghirardelli chips work well). But you could use all chocolate squares or all chocolate chips if you like. Just make sure to use high-quality chocolate—you’ll really taste it in these cookies. Why melt chocolate and butter together? Because melting chocolate by itself is dicey. If plain melted chocolate comes into contact with moisture (sometimes even steam), it can “seize”—instantly morphing into a block of grainy brown concrete. Melting with butter prevents this. If you melt chocolate on top of the stove, use low heat and watch carefully to make sure it doesn’t scorch. You can substitute light-brown sugar in this recipe, but I think dark brown yields the best flavor. Eggs carry a slight (but real) risk of salmonella. So I suggest using pasteurized eggs for cookies. Although it’s unlikely that the eggs you buy will be infected, why take the risk? Especially since most of us can’t make cookies without tasting the raw dough. We’ve used all sorts of baking sheets for making cookies over the years, including expensive insulated sheets. Nowadays, we just use 11 x 17-inch half-sheet (jelly roll) pans with 1-inch sides, and line them with parchment paper. (They’re called half-sheet pans because they’re half the size of the full sheets that large commercial ovens can accommodate). Half-sheet pans provide ample surface space and the sides keep the cookies from slipping off. We can’t say we’ve noticed much difference in quality. Although some of the fancier sheets theoretically make for better results, none of them are likely to perform as advertised in the typical home oven, where baking conditions are sub-optimum at best. (The temperature of our home oven tends to be off by 25 degrees or more, for instance.) So we just go with what’s easiest to use—and quickest to clean up. We’ve made these cookies both small (teaspoons of dough) and large (heaping tablespoons). We like the large version better. “Looks like you’re doing a pretty good job on this round too,” she observed. “Well, you have to admit they’re hard to resist,” I said. Wish she wouldn’t read so much. Oh yeah! Instant espresso works magic with chocolate, which is already magical. :) The milk is mandatory for dunking with these beauties ~ love every bit of it! Great job Mrs KR! I am so apply to see walnuts in the cookies because I think nuts add such a lovely crunch, flavour and interest to an otherwise soft cookie. Love the deep layers of flavours in this. I could enjoy a few with an espresso, yummy! You had me at chocolate... I stopped baking at home. My poor kids. I would eat all the delicious cookies, brownies and cakes before they could!! Just dreamy! Boy, you are on a chocolate high this month and I'm happy to go along for the ride! These look spectacular and I bet they taste even better. I'll have to check out Helen's blog but I swear I've seen her on Linked In under a different name. Whatever. I'm just happy you made these cookies. Well, Mrs. KR made the cookies. I'm just happy you get to eat the cookies! The folks I'm living with assured me that they had adequate baking equipment and supplies; they would be happy to share as they knew they would be the recipients of my efforts until I love again into my own place. What they forgot to share was that their equipment was all from their wedding 32 years ago...I quickly found a stand mixer to borrow and was EVER so grateful that I did decide to bring my Cuisinart and most baking supplies with me. Good idea too. They had a bottle of vanilla that a neighbor had brought them from Taiwan. Oh my gosh John...the scent is horrible and yes, the taste was evident and ruined some cookies for me. It was all natural vanilla too but something was really off from what I'm used to...and I'm not a vanilla snob; I normally get mine from Costco! Chocolate cookies are always a hit in my family!!! Bookmarking this recipe to make it over the weekend. Thanks for sharing the recipe!!! Hi Judy, I agree that espresso and chocolate is such a tremendous combo! And milk and cookies is a classic. ;-) Thanks for the comment. Hi Nazneen, an espresso + these cookies = total bliss! And I agree about the walnuts - they're great in most baked goods. Thanks for the comment. Hi Laura, baking is dangerous, isn't it? I mean you have to do a quality control - a lot of it! - which means lots and lots of testing. Which means tasting. Or devouring. ;-) Thanks for the comment. Hi Abbe, yeah, we've been doing a lot of chocolate lately, haven't we? Although these pictures are weeks old - we actually made them during Tiki Month, so they really didn't fit in then. Helen's blog is good - she's a professional (literally). Thanks for the comment. Hi Barb, people who don't really cook or bake have no idea what someone who really does it needs. Sigh, our KitchenAid stand mixer of 30+ years sounds like it's about to die (really noisy at high speeds) so we've been looking at replacements. We assumed we'd get a new KitchenAid, but sounds like the current models had issues (unclear whether the ones currently being sold do). So we're actually looking at the Cuisinart Mixer - sounds rather interesting. Anyway, you should try these - one of the best chocolate cookies I've ever had. And Mrs K R bakes a lot, so I have loads of experience! Thanks for the comment. Hi Shibi, you and your family will love this, trust me. Truly delish. Thanks for the comment. As a life long chocoholic, I say this is right up my alley. They look fabulous, just fabulous! There are some days that just plain ol chocolate will do quite nicely. Then there are other days that one needs to go over the top with chocolate and expresso. Clearly, Mr. K.R. understands both! I can honestly say John that if this batch of cookies were to be presented to me at this very moment, I would absolutely devour them!!! Thank you so much for sharing, I better save this recipe for any day! I love the deep rich color of chocolate here. Hi Gintare, they really are fabulous - this is a terrific recipe. Thanks for the comment. Hi Charlie, your uni students might turn up their noses (all that sugar!). Until your back was turned. ;-) These really are great. Thanks for the comment. Hi Louise, these really are hard - impossible! - to resist. Super flavor. Mrs K R does know her chocolate. ;-) Thanks for the comment. Hi Simi, these really do have deep, delish flavor. Wonderful stuff! Thanks for the comment. Hi John , bookmarked this recipe , my family loves chocolate , I will be Queen of the castle for making these , so yummy , thanks for sharing :) please give my thanks to Mrs. Kitchen Riffs . These are beautiful and would make quite an impressive gift for the holidays (can't even believe I am saying that word)! Hi Nee, your family will worship you when you make these! They're great. ;-) Thanks for the comment. Hi Alyssa, these would be a great gift for the holidays! And I can't believe how quickly they're sneaking up - Mrs K R and I were just talking about that the other day. Anyway, thanks for the comment. I can see why these might become my new best friend, and I must agree with you...larger is always better! Thank you for sharing. I wish I had one to go with my cup of tea now! Hi Monet, these are so delish. And when you make them larger and have two, you don't think you've had as much. ;-) Thanks for the comment. Hi Uru, I'll never have as much chocolate on my blog as your have on yours, but we have been doing a bit of chocolate lately, haven't me? ;-) Thanks for the comment. Hi Debra, always a good thing! Thanks for the comment. I made chocolate M&M cookies today for my college boy. But now I want your grown up cookies!! Pinning so I don't forget to try these!!! Hi Terra, your hubby will appreciate these! ;-) They really are good. Thanks for the comment. Hi Liz, I'll bet your M&M cookies are good! Maybe we should trade? ;-) These are, I must say, wonderful. Thanks for the comment. Hi Amy, I wish you had these in front of you too! You'd be happy, I assure you. ;-) Thanks for the comment. Hi MJ, you should always listen to your cookie monster. ;-) Looking forward to seeing how you've been dealing with your chocolate craving. ;-) Thanks for the comment. Wow. Just wow. This post is amazing, deep dark chocolate chips i love to have the whole plate right now. Hello besties! Yeah I have to say I am a sucker for dark chocolate. It must be in our blood and somehow my husband feels the same way. Definitely the second sign in a week and I should make dark chocolate cookies soon. Thanks John! You can never have too many chocolate cookie recipes. I almost always add espresso to mine as well, it makes an ordinary cookie extraordinary! Great recipe. Terrific! Those moreish and decadent cookies are irresistible. Ooh, now I know what 'double-acting baking powder' is. 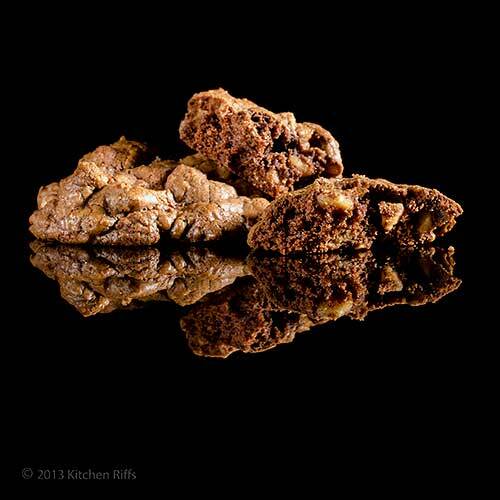 Great looking cookies and thanks for the heads-up on the blog The Ardent Cook! Hi Ashley, when I was a kid I wasn't a huge chocolate fan either, but now I love the stuff. ;-) Thanks for the comment. Hi Lizzy, yup, these have got your number. ;-) Thanks for the comment. Hi Cquek, unfortunately it's all too easy to eat a whole plateful of these! Thanks for the comment. Hi Helene, you really need to make these! They're great. ;-) Thanks for the comment. Hi VIcki, isn't the expresso trick so interesting? And it almost always works! Thanks for the comment. Hi Rosa, these really are irresistible, at least to me. ;-) Thanks for the comment. Hi Kumar, if you're making a huge batch, do invite friends so you won't have to eat them all yourselves. What am I saying? Just keep them all to yourselves and enjoy! ;-) Thanks for the comment. Hi Fran, these really are great cookies, and ones I think you'd enjoy. Maybe too much! ;-) Thanks for the comment. I can't get over how good and choclotey these look. Being a crazy chocoholic, I can totally understand this language. I think it's really nice to add the nuts in it, a crunch on any cookie is absolutely good. Hi Asha, they're really a good cookie. If you're a chocoholic, you definitely need to try these sometime - they're wonderful! Thanks for the comment. These cookies look like pure chocolate decadence! Hi Laura, they are, they are! ;-) Thanks for the comment. Hi Greg, I know what you mean - lucky for me Mrs K R is a baker! But these are pretty easy to make, and the flavor is really worth it. Thanks for the comment. Oh so making these soon! They look so full of chocolate and flavor! I am on a freezer cookie dough marathon, as it is handy to have sometihng in the freezer that I can bake when I have someone coming over. Do you think this would freeze ok ? Hi Ilke, you won't be sorry when you make these! Really good. Mrs K R says the baked cookies freeze fine, but she's not so sure about the dough. She hasn't tried it, but her instincts tell her no. Thanks for the comment. Hi Marina, espresso powder is indeed basically instant coffee (though with better flavor!). Manual mode in cameras can be scary indeed, but learning it is so worthwhile - so much more control. Thanks for the comment. Why hello there! What a looker you are. ;) Chocolate and espresso are the perfect pair in baked goods. I can eat a boatload of these. Thanks for sharing John! These look so good and would definitely fulfil my chocolate craving right now. Hi Anne, these are indeed a looker! I can eat a boatload too, alas. But it's worth it! Thanks for the comment. Hi Caroline, aren't these nice? And they do satisfy a chocolate craving. And of course when you think about them, start a new one! Thanks for the comment. 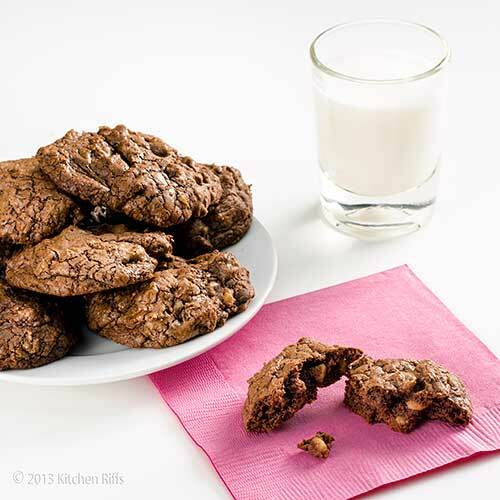 Chocolate cravings have been stirring lately, and these cookies would come in handy! Walnuts sound great in them too. Great cookies especially with the dark chocolate addition! Hi Lisa, those cravings are so hard to resist, aren't they? Just give in, and embrace the dark side. ;-) Thanks for the comment. Hi Nik, these really are so flavorful! And a great cookie to experiment with. Thanks for the comment. Chocolate obsessive - who me??? Yes, of course! I really do need to make these pronto. Hi Jeanne, you really do need to make these! Truly delish. ;-) Thanks for the comment. Hi Nusrat, I dunno, I admired them for a couple of second, then starting gobbling. ;-) Thanks for the comment. I'm thinking Christmas cookie exchange. That is if they last that long. Chocolate cookies are so addictive. That's my story and I'm sticking to it! Hi Karen, these would be great exchange cookies - the recipients would think you're a goddess! ;-) Thanks for the comment. I am one of those people that are obsessed with chocolate, so I would love these. Look so yummy!! Hi Dawn, if you're obsessed with chocolate, these have your number! ;-) They're truly delish. Thanks for the comment. My goodness. These look so good! I'm experiencing a major craving for chocolate right now. And these would so hit the spot. My next baking project! Oh my, these look wonderful. I made something similar with macadamia nut and a little butter, love the darkness and richness of this cookie. I am choco-overdosing on these already, and I haven't even gotten to make them yet. Looks so delish, thanks for sharing--glad you're getting in some oven time, John! Hi Gomo, these are really excellent cookies - I think you'd like them. Really worth trying. Thanks for the comment. Hi Honey, these are really excellent. Macadamia nuts sound like a fun variation! Thanks for the comment. Hi Ala, these are really your kind of cookie, IMO. Perfect for tackling that massive reading list you're facing! And with these, maybe you'll finally power through Don Juan. Maybe. ;-) Thanks for the comment. Seriously.. coming over to visit your blog is downright dangerous:D That first photo is incredible, I love the reflected symmetry.. it just entices a reader to take a bite. You need to publish a cookbook! Hi Barb, I love living dangerously! ;-) Thanks for your kind words, and comment. These cookies look like a brownie cookie that I make that is extremely dangerous to have in the house b/c the hubs and I eat them all - Love the espresso addition. Hi C.J., these are almost brownie-like. Really rich! And delish. ;-) Thanks for the comment. I keep seeing these on pinterest and I knew they were yours. You have that touch, every photo is amazing. And I need these cookies in my belly now. I love cookies but rarely make them. Odd right. I always think of the Friends episode where Phoebe says she doesn't make her oatmeal cookies all the time because it wouldn't be fair to all the other cookies. I feel like that with my mom's pb ones. I bet these mixed with hers would be incredible. PB and dark chocolate, it would be heavenly. When I saw the cookies, I thought it might be Mrs. KR's turn. I always enjoy seeing her awesome baking on your blog! My family would adore these cookies - thanks for the idea. Hi Kim, my black acrylic photos do have a pretty distinctive look. ;-) These really are a terrific cookie - definitely worth trying. Maybe you can make a turtle version! ;-) Thanks for the comment. Hi Beth, you'll really like these cookies - they're excellent. Mrs KR does good stuff! Thanks for the comment. I haven't made cookies in ages. Your post has perfect timing for a girls party on Saturday. They'll be the hit of the party. That looks sinfully decadent. Love that chocolatey goodness. Hi Kristi, you'll have some happy people on hand if you bake these! That is, if you can stand sharing them. ;-) Thanks for the comment. Hi Raymund, these are totally wonderful - a truly great cookie. I recommend them. ;-) Thanks for the comment. Hi Kiran, these are truly wonderful. If you're a chocoholic, you really owe it to yourself to make these some day. I wouldn't steer you wrong! ;-) Thanks for the comment. I bet the espresso powder makes these just divine! Hi Kristi, the espresso powder really is a super addition! Thanks for the comment. Hi easyfoodsmith, you're so right that these cookies are a treat! Thanks for the comment. Cookies that are baked and ready in 30 minutes is exactly what I'm looking for. You guys just made it way to easy to satisfy my chocolate cravings! Hi Yvonne, this really is a great cookie, and you can definitely be eating the first of the cookies within 30 minutes after you begin making them. :-) Thanks for the comment. Hi Amelia, these would be great with coffee! Really a wonderful cookie served with anything, or just by themselves. Thanks for the comment. deep, dark chocolate cookies are one of my all-time favorite things, any time of year. I like your copious notes here, especially the ones about vanilla and the difference between pure and imitation. although i keep imitation in my pantry for a select few things (generally white things which i want to stay pure white, or for recipes requiring that confectionary flavor of imitation vanilla), pure vanilla is what i use 99% of the time, because it's just better. there's a warmth and realness you get from it that the imitation just doesn't match; definitely not interchangable, in my opinion. Hi Shannon, who can resist a great chocolate cookie? And there really is a lot of learn about vanilla! Thanks for the comment. I adore freshly baked baked cookies, especially ones with chocolate in them. Hard to resist eating a whole plate of them though hehe! Hi Christine, it's really hard resisting these! Although they're actually pretty rich, so you do fill up after several. ;-) Thanks for the comment. Hi Kitchen Butterfly, glad I'm not tempting your son! Otherwise you'd be baking cookies. ;-) Which you should probably be doing anyway! :D Thanks for the comment. haha, that Marx comment and your reply made my day. You should enjoy as many as you want, they're not just for the pictures! something we food blogger sometimes forget! Hi Paula, :-) Don't worry, I got plenty! Thanks for the comment. Hi Hannah, these are terrific cookies. Your son will love you even more than he already does if you send him these! And he'll be quite popular with his fellow dorm mates. ;-) Thanks for the comment. Hi Sowmya, they're really great! You'll enjoy. ;-) Thanks for the comment.